This sermon was the sixth and final in our series, “Practicing Christian,” on the spiritual practice of Giving & Gratitude. Well, here we are. The final Sunday in the season of Lent and the final Spiritual Practice in following Jesus. Of course, we saved the best, and most exciting for last: the practice of giving. I’m surprised that you didn’t meet that with applause or amens. Giving, and we’re talking about financial giving, might be the most controversial Christian practice there is. Sometimes for good reason. I love this Onion headline. Obviously, they’re pointing out the fact that sometimes “giving to God” is used as a way to manipulate people out of their money. But it doesn’t have to be that way. Whether it’s giving to the church, or charities, or personally face-to-face in need, giving at its best is a spiritual practice. It’s a discipline that holds the possibility for personal transformation. So today I want to talk about why we, as followers of Jesus Christ give. To do that, let’s look at the first two verses of the twelfth chapter in Paul’s letter to the church in Rome. Even though these two verses don’t directly mention giving, this short little passage sets the foundation for why we practice it in the first place. First of all, we give because we believe that everything, every inch of creation, and existence, itself is a gift. This passage comes at the hinge point in the whole letter, written to the church in Rome, a church that Paul helped plant and now helps to oversee. Here in this letter, Paul’s trying to tell the whole Christian story from beginning to end. It begins with God’s work since the beginning of time, creating and upholding the world. Then there’s the world falling into brokenness and disobedience. But then there’s God’s call of person after person. Forgiveness after forgiveness. Second, third chances. Fourth and fifth chances and so on and so on and so on. The common thread through the story is its focus on God: God’s gifts and God’s love, God’s faithfulness, God’s patience, God’s forgiveness, coming to climax and into focus in Jesus on the cross. The ultimate demonstration of God’s nature as the ultimate giver. “Giver of the perfect gift/only hope of human race,” as the old hymn puts it. The giver of life and the giver of salvation. That’s what he means by the “mercies of God.” No matter how much human beings have screwed it up, God keeps going and going and going. In this letter, everything good has been God’s doing. It’s all gift. Beginning to end. In one way, this reflects a fundamental truth of existence, even if you’re not a Christian. We didn’t invent existence itself. Whether you believe in a God or not, you’ll have to admit that there was nothing we did or ever could have done to exist in the first place. We didn’t invent ourselves. The mere fact that there is something and not nothing, is a gift. Any success, beauty or joy we’ve experienced has come from somewhere and someone else. We had to have parents to exist. Who had parents, who had parents. If we’re a brilliant musician, we may have killed ourselves with practice, but someone taught us to play. Or if we’ve made lots of money and climbed the ladder, we wouldn’t be there without all these other people that have made our success possible. Employees, investors, the economic system that makes it possible. In every case, we play a part, for sure. But the fact is that there’s a part to play in the first place was never our doing. In philosophical language, nothing that exists is the cause of itself. Paul would see all of this as an act of grace, the outcome of the “mercies of God.” And even though the language we use is “earning,” it includes money, too. We practice giving because everything we have, including money, is a gift. All the way up the chain to the beginning, in one way or another. One that none of us earned. Or ever could earn. To give what we have away reminds us that it was a gift in the first place. So if life’s a gift. For Christians, a gift from God. Then how do we show gratitude for a gift? We show gratitude for a gift by perhaps saying “thank you,” acknowledging the source of the gift. Maybe remembering to pick out something nice when that person’s birthday comes around. But this is God we’re talking about. What do you buy for the Creator who has everything? There’s nothing we can do that will somehow match the gift that we’re given. It’s a “gift exceeding every debt.”[i] So our gratitude has to take a different shape. Paul says to present our bodies to God as a living sacrifice. In Paul’s time, sacrifices were made at the Jerusalem temple, mostly in the form of live animals. [ii] The blood of the animal would be shed as an offering to God, an offering for sins committed, or an offering of gratitude. Paul turns that whole idea upside down. There are bodies, yes. But these are the bodies of living human beings. By presenting our bodies, Paul says, we’re presenting everything we have and all that we are to God in gratitude. God doesn’t need our dead bulls and our goats. None of the money collected at church goes directly to God because God doesn’t need it. God is like that U2 song, “All I Want is You.” God wants our whole lives. Our whole lives to be a reflection of God’s life and love. Meaning God wants our money to be a conduit of divine love like everything else. But of course we can’t simply offer all of our money as a living sacrifice. We use it for all sorts of practical things, including stuff like food and housing that we need to live. So the way followers of Jesus offer our sacrifice is through the spiritual discipline of tithing. The historical Christian discipline of tithing is setting aside 10% to give, specifically to one’s community of faith. Tithing literally means “tenth.” It’s is based on Biblical directions concerning “first fruits.” It’s actually considered a starting point in scripture, believe it or not. Of course, they didn’t pay taxes in the same way we do for essential services which were often undertaken by the church. But still that’s like, the biblical minimum. In one way, this recognizes the importance of a faith community by supporting it. Churches like ours do a lot of good things. Like faith formation, spiritual community, inspiration, feeding people, and loving and caring for them. But it’s also for its symbolic value. We offer up our money to a faith community because this is where we encounter God. It’s where we hear and experience the good news, and it’s where love and service to the least and the lost takes place. Jesus says “where our treasure is, our hearts will be also,” and so to tithe is a way where we can symbolically offer our hearts to God’s mission in the world, in the trust that the rest of our lives will catch up. It may sound crazy, but there are people here in this church community, people with completely different levels of income—high and low—who actually tithe 10% of their income. I don’t know who they are, because the only person who knows how much people give is the envelope secretary. But I know there are people who do it. For both reasons above. And I know that it’s hard. It takes practice, and few of us are prepared to undertake this kind spiritual athleticism. But I love this other part Paul says. That our bodies, our whole lives, are already a sacrifice that’s “holy and acceptable to God.” That it’s not about offering God the perfect sacrifice, but that we can respond with gratitude here and now and exactly as we are. We’re already holy and acceptable in God’s sight. Meaning that we don’t have to work our lives up before we can give them away. Doesn’t matter what we have. Or where we’re at. What we’ve got here and now is enough to begin, no matter how little or how much money we have to give away. The important part is seeing money as part of the whole life scheme of gratitude. If we see life as a gift, the only response is gratitude for everything—money included. Like the song we sang at children’s time said “I’m gonna give so God can use me.” To offer ourselves and our money as a living sacrifice reflects the love and mercy of the giver. We give because everything’s a gift. We give because the proper response to the gift is gratitude. But there’s more. We give, because generosity changes us for the better. In starting to see life as a gift, and generosity as the response, we’re pushing against huge social and cultural and spiritual forces. We live in a culture that promises us happiness through success, through acquisition, through consumerism, technique and control. There’s always another goal to achieve, the next house to mortgage or the latest car to buy. And we all know that none of this is true. Even though we know it, we’re still willing to believe the lie. We may get what we want, but the feeling always disappears eventually. And it’s on to the next thing. We have a biblical word for that—it’s idolatry. Which means looking for ultimate meaning and happiness in something other than God. Our consumer society is built on dissatisfaction, which is the opposite of gratitude. It’s a recipe for anxiety, fear and exhaustion. Because there’s never enough. To say “life is a gift, I have enough, I am enough, and I have enough to give away” is radically counter-cultural. But when we see life as a gift, we find our minds renewed, and we begin to have more clarity around the will of God for our lives. Because we’ll actually become happier, better people, because what we have is enough. When we recognize we have enough, then it means that we can be content, we can be satisfied. 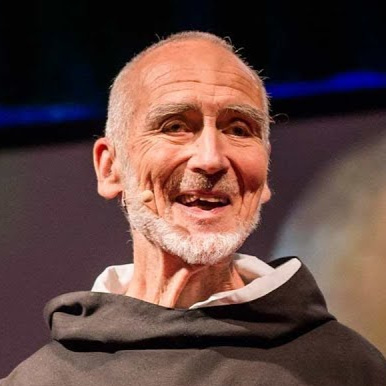 The Austrian Monk David Stendl-Rast puts it like this: “It is not happiness that makes us grateful. It's gratefulness that makes us happy.”[iii] Waiting until we’re happy to be grateful simply doesn’t work. But practicing gratitude itself ultimately bears the fruit of happiness. When we start giving some money away, we become less fearful. Because when we give, we start to trust that we have enough. Giving something away isn’t gonna be the little wooden Jenga block that brings the whole tower of our lives down. Because God is the giver, it means the gifts never end. So there we are, brothers and sisters. The spiritual discipline of giving, of generosity. We give because, in the end, giving changes us for the better. When we start to do it, we experience a kind of spiritual detox. Like a muscle, it becomes easier. Give some away, we’ll find ourselves giving more away. And when we do, we discover that generosity actually makes us feel good. In giving, God again gifts us. Gifts us with true joy. This is why we do it. So regardless of how much you give, or who you give to, I hope and pray that each of you experiences both the joy and blessing of returning the gifts we’ve been given to our generous giver. [i] See David Bentley Hart’s positive appraisal of St. Anselm in David Bentley Hart, The Beauty of the Infinite: the Aesthetics of Christian Truth (Grand Rapids: Eerdmans, 2003). [ii] NT Wright, “Romans,” in the New Interpreter’s Bible Commentary, vol. 9, gen. ed. Leander Keck (Nashville: Abingdon, 2000), 704.